Alfa Romeo is in the process of creating a quality bicycle range in tune with the dynamism and sporty nature of the Alfa Romeo brand. In total three individual types of Alfa Romeo bicycle will go on sale over the coming year, with the “Alfa Romeo Stradale” being the first. The Alfa Romeo Stradale bicycle was designed in collaboration with Milan-based Compagnia Ducale srl, represented by Veber Ferrari. Veber Ferrari created the design with Wolfgang Egger, chief designer at Centro Stile Alfa Romeo. The shape of the Stradale’s frame has been inspired by the dynamic arrow-shaped Alfa Romeo grille, a feature which has always been a prominent and important feature on Alfa Romeo models ever since the 1946 6C 2500 Freccia d’Oro. The “scudetto” frame is made from TIG welded aluminium series 7005 alloy, whilst the fork is realised in partially exposed carbon fibre to emphasise the quality, emotion and sportive nature of the Alfa Romeo brand. The Stradale is finished to a high standard and, true to the Made in Italy theme, is entirely fabricated from Italian components, with the exception of the Michelin tyres. Main suppliers include Campagnolo for the 2x10 gears, Miche for the 28-spoke wheels and brakes, and Sella Italia for the saddle which has specifically been designed for comfort and protection of the prostate. Not only is the Stradale name evocative of legendary Alfa Romeos such as the 1967 Tipo 33-2 Stradale, but it also intentionally suggests as to where and how the bicycle will be used: a bicycle for daily use on the street, however a product which provides great emotion to the owner. 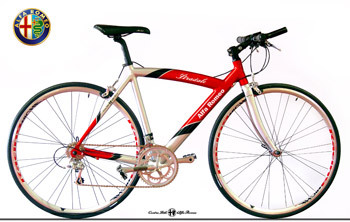 The result is a bicycle which introduces a new concept of combined sport, comfort and elegance. Thanks to its aggressive and slender line, together with its dynamism and compactness, the Stradale combines all the elements which distinguish the style of Alfa Romeo. In total, the bike weighs no more than 9,8 kg, and comes standard with a bespoke red cover. The price is a respectable 1.690 euros, and the bicycle will go on sale at selected Alfa Romeo dealers and bicycle shops as well as at the Mirafiori Motor Village. Owners of the Alfa Romeo Stradale bicycle so far include Sergio Marchionne, Lapo and John Elkann, Antonio Baravalle, a renown Swiss Alfa Romeo collector, and a large Italian-based Alfa Romeo club. The Stradale bicycle made its international debut at this year’s Geneva Motor Show back in February together with the new Alfa 159 Sportwagon and Spider, however it made another official appearance at the Festa d’Italia in Genk, Belgium. The Festa d’Italia, which was held during the evening of Saturday June 3, was organised to celebrate the 60th Festa della Repubblica, the anniversary of the proclamation of the Italian Republic, on June 2. Maurizio Scanavino, official spokesman for Brand Promotion Alfa Romeo, Fiat and Lancia, unveiled the Alfa Romeo Stradale bicycle together with Vezio Pagnotta (President of the Alfa Romeo European Dealers Association) and Paolo Pagnotta (from dealership Pagnotta Alfa Romeo) to an impressed audience. The particular prototype bicycle on display will be auctioned off, with the proceedings going to a special cause. On hand was also the brand-new Alfa Brera 2.4 JTDM resplendent in Grigio Touring, as well as the Alfa 159 2.4 JTDM, now available with a 6-speed Q-Tronic automatic transmission. Other cars included a Ferrari 360 F1 Spider, Fiat Grande Punto, Lancia Ypsilon Bicolore and an ex Mille Miglia Lancia Aurelia B20 GT which fittingly represented the centenary of the Turin-based brand during this festive occasion. The lake setting of Hotel NH Molenvijver, Genk, offered an elegant backdrop for the Alfa Romeo Brera 2.4 JTDM and Alfa 159 2.4 JTDM, a model now available with the Q-Tronic 6-speed automatic gearbox. 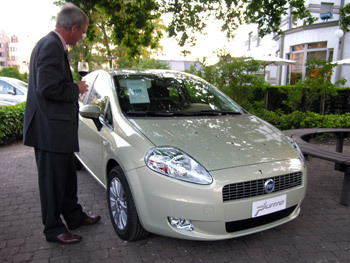 Other cars included the Fiat Grande Punto and Lancia Ypsilon Bicolore. Top: Maurizio Scanavino (Fiat Brand Promotion), Vezio Pagnotta, Paolo Pagnotta and Veber Ferrari unveiled the Alfa Romeo Stradale bicycle to an impressed audience. 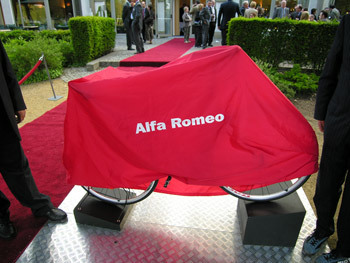 Above: there are currently two bicycles in the Alfa Romeo accessory range, the Stradale and Cross. 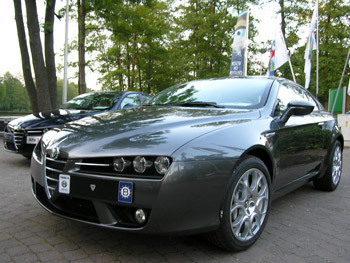 The Festa d’Italia was organised by the leading Italian companies of the Belgian Limburg region, including Ralux (a leading European carpet manufacturer, owned by the Italian Radici chemical group) and the Belgian importer for Scrimaglio wines (the official Alfa Romeo, Fiat, Lancia and Juventus branded wine). The evening was closed off with an exciting fireworks display and a glass of grappa. 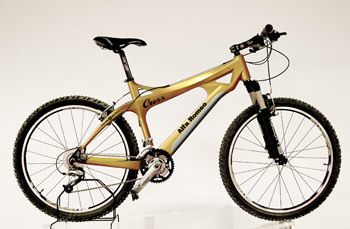 Also recently unveiled in Italy is the Alfa Romeo Cross, a mountain bike finished in the same gold colour as the Alfa Romeo Kamal crossover concept car. This particular bicycle, with front suspension and a Kamal-inspired frame, will cost around 2.500 euros. Alfa Romeo will be unveiling their final bicycle, a limited edition carbon fibre racing bike, at the Paris Motor Show in September alongside the production version of the 8C Competizione sports car. 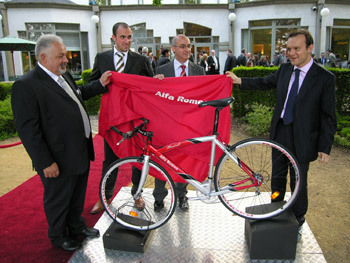 This particular bicycle will cost in the region of 4.000-5.000 euros, and will probably be limited to around 30 units.